The Full Circle Power Pad is designed to work with both the Porter Cable 7800 and Flex power sanders. 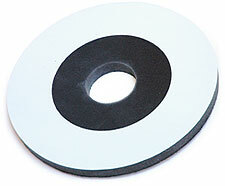 The Power Pad attaches your Full Circle Level 360 Sanding Disc to the power sander with a firm, seamless adhesion using hook-and-loop technology. The Power Pad has a structural backing material that prevents premature tearing. This structural backing also keeps the disc totally flat when sanding; greatly reducing "swirls".